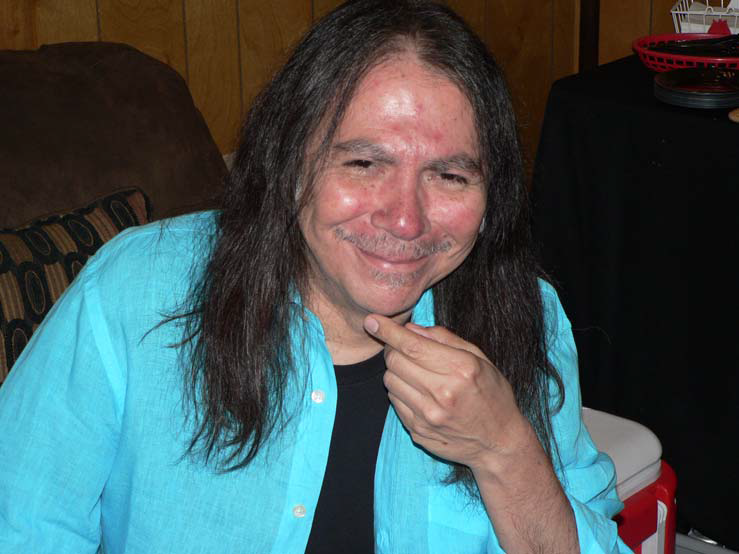 Memories continue to pour in for Rick Rosas, who sadly passed away last week. 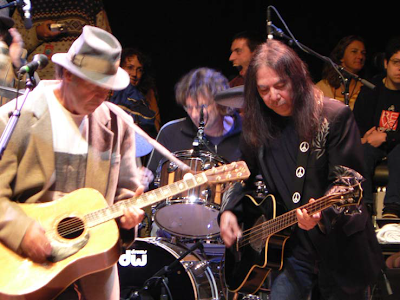 Here is an interview with Rick Rosas backstage at the Shoreline Amphitheatre during the Bridge School concert on 21 October 2006 by with Paul Docker. The interview was published in the Neil Young Appreciation Society's magazine Broken Arrow, Issue 105, February 2007. Out of the blue Rick Rosas dropped me an email last year asking if he could have a copy of the magazine. He offered to pay for it, said, “I play with Neil”, and in case perhaps I didn’t know who he was sent me a photo of him on stage on the CSNY tour! Even this veryfirst contact told me something about this man’s great modesty. Of course I was delighted to hear from him and sent him a couple of recent issues with our compliments. I also asked if we could do an interview when he was playing at the upcoming Bridge School Benefit concerts, which he was happy to do. I was only sorry that I couldn’t make the trip personally and the interview was therefore left in the hands of my trusty amigo Paul Docker, who takes up the story. Ed. Paul Docker (NYAS/BA): Thanks for giving us the opportunity to talk to you today. I’m keen to talk to you about all that you’ve done, not just about your work with Neil. Could you tell us a bit about your career, about what you have done yourself and also in terms of working with others, including Johnny Rivers and Joe Walsh? stuck in it, as it wasn’t getting me anywhere. So I moved down there. At that time Joni Mitchell was living there and lots of people and I got to hang out with the guys from Love and people like that. It changed my whole attitude to playing. I played in a lot of bands around that time. I think it was about 1984 that I got a call from Joe Walsh who asked me to come in and work on his album, The Confessor. I sort of knew Joe a little bit, I knew his drummer Joe Vitale, and he said ‘If you come out you’re not gonna freak out?’ ‘Freak out? !’, I said. ‘No, I’m not gonna freak out’. F*#k you, I’m not gonna freak out. And he said ‘Alright, well come on out’. I played on a couple of tracks on the album he said ‘leave your bass here’ so I came back and finished the album and did about half the album with him. That pretty much started things for me. I’d been in bands and I’d recorded with a bunch of people but that was the first break, right there. After Joe Walsh I picked up a tour with Dan Fogelberg about a year later. We did a little tour with Joe Vitale and the band and then after that Joe and I used to go out and do a lot of radio shows, just like Talk on the Radio and all that and Joe and I did a lot of shows. We toured all over Australia, New Zealand and Japan, a lot of different shows. I think it was 1987, I was playing at Farm Aid with Joe, and I met Neil there. Apparently Neil remembered me and in ’88 he gave me a call and asked me to come up to his ranch and do some overdubs on the Bluenotes album. The bass and drums weren’t working together and I tried to do a few overdubs but I said ‘We’re gonna need my drummer too’. So I brought in my drummer, Chad…Chad Cromwell, and we over-dubbed about two or three songs and when we eventually came back out here we decided to redo all the songs for the album. So that was 1988, ’89 and ’90. We did a lot of touring, New Zealand, Japan, Australia trip as The Lost Dogs. PD: It was The Restless until apparently someone threatened to sue, is that right? RR: Yeah, yeah, I guess so, probably yeah. These things happen. With the Bluenotes too, they decided to sue with the Bluenotes because there was another Blue Notes. So that went on in between those years. I finished working with Neil in about 1990, so it must be 16 years without working with him. He called me and he had some ideas but he didn’t have any songs yet and I said that, well, I was basically immensely prepared to do it with whatever songs he had. It took about three months or so before he finally called me and said ‘OK, I got a song’. And he flew me to Nashville and we recorded it and that night he wrote another one and we went and recorded it the next day and then the next one. He just built it up. PD: Which was the first one? RR: The first one was “The Painter”. Each one was pretty much done that way. The first song was the first song we did, the last song was the last song. (indicates a linear progression with his fingers on the table) (We are interrupted by Amber Young at this point…she’s looking for a beer.) After a couple of songs, that’s when he found out…he found out he had this brain aneurysm and he took a couple of weeks off. After the procedure he was raring to go and we went back and we finished that album pretty quick. So that’s history right there. We then did Living With War and all that with Johnny Rivers…. I’ve known Johnny a long time. He lives in my neighbourhood in Studio City, California. I’ve always been a big, big fan of his. I got a call and I played on his stuff. I just recently did a couple of sessions with him and Jim Keltner for Johnny’s anthology album…or something like that. PD: So, when did you first start working with Johnny Rivers? work with him. I play Monday nights with the band…. Waddy Watchel…. RR: Yeah, The Joint. We’ve had a lot of people come through…if you see the website it’ll tell you a lot of people that have played. Johnny played a lot. PD: And you’re always there when you can be on a Monday? RR: Yeah. I’m gonna be there this Monday, I’m not going to be there the next Monday after that but I’ll be there the next two weeks so it’s touch and go. PD: Do you have any idea who’s turning up or is pot luck as to who shows on the night? RR: Well you never know. This Monday we’re going to have a guy who plays in Mike Campbell’s Band...Mike Campbell from Tom Petty’s band. Mike has played with us, he may come to the show, it’s one of those things, we never know. Terry Reid has been with us for a long time. PD: You also did something for the Jerry Lee Lewis ‘tribute’? produced his album (Last Man Standing) and the bass player that played on most of it, Hutch Hutchinson, is out on the road with Bonnie Raitt. So he kind of suggested me. Jimmy had been down The Joint playing with the band and he felt I was adequate for the show and offered me the job. About two or three weeks ago we went to New York and did two or three days of taping. The back up band was Nils Lofgren, Ron Wood, Jim Keltner, Ivan Neville and Jimmy Rip and Kenny Lovelace from Jerry Lee’s band. The first week we backed up the people with whom he did duets. This is going to be a PBS special, I believe, and we backed up Don Henley, Chris Isaac, Solomon Burke, Buddy Guy, Willie Nelson, Norah Jones, Kid Rock, Tom Jones, John Fogerty, Kris Kristofferson …I’m probably missing a few other ones…. PD: That’s an impressive line up. RR: Yeah. I imagine it’ll be out next year. PD: Given you’ve played with a fair few people, who would you say your influences are? RR: Neil Young and Joe Walsh. I’ve always loved their music. I’ve always been a big fan of theirs since I was a kid. I just wanted to walk with them. I got to go to some places I wanted to go and I’ve been very lucky. PD: You chose to play the bass. When did you make that decision? RR: When I was a kid. There weren’t too many basses around...bass players that is…I play guitar, I played guitar in a band. I got an offer from a guy I knew who was real talented and said ‘Well, if you pick up a bass you can join my band’. So I went for it and that’s pretty much it. I love it, I’ve always been fond of the bass guitar …I really just love it…the whole idea, what it sounds like and everything. (Rick is flicking through BA 103). I’ve just been on the CSNY tour. Did you get to see that? RR: I guess not. (Spots advert for Heart of Gold film in back of BA). Did you see this? PD: Yeah. Saw it at a premiere in London. Great film. RR: Lots of people there? PD: Yeah. It was sold out. A lot of film types as well as Neil Young fans. RR: Was Jonathan Demme there? PD: No. He was supposed to come and talk but cancelled, which was a real shame. PD: Now here’s a question I’ve been forced to ask you by some of the girls we have with us this weekend who are very, very impressed with your hair. They want to know what hair products you use! RR: (Rick laughs, but then gives a serious answer – for which I’m grateful given the threats levelled against me had I failed). I change around. You can’t use the same ones all the time ‘cos the hair just gets used to it. You’ve got to keep on changing. PD: Do you like Gillian Welch? RR: Is that who this is? This is great? Is she from England? PD: No, no. She’s from California. She’s a big Neil fan. Sometimes she and David Rawlings will go out and play a bunch of Neil songs as well as their own stuff. PD: You have your own studio, called Smartso, I believe? PD: Where did you get the name from? RR: It came from when I was on the road with Joe Walsh. I’ll try to make a long story short. The drummer we had was Zak Starkey. Zak and I were getting drunk and we played a joke on Joe’s road manager and we went through the Yellow Pages and found a clown, a guy named Smartso the Clown. We asked him to come down to the gig and apparently he got all upset because we were supposed to tell someone to let him in but we got too dunk and we forgot to tell anyone. So he called back and said ‘I don’t know who you guys think you’re clowning around with but I’m Smartso the Clown!’ He got real upset about it. So I always loved the name Smartso. Zak Starkey’s a dear friend. A great drummer and it was an honour to play with him on a tour with Joe Walsh. PD: When playing with Neil on his albums do you get to contribute to the development of the music at all? RR: He’s pretty free about that and let’s me play whatever I want. He will come up with maybe a lick or two and he’ll say ‘Try it’ and it’s usually great but he gives me a lot of freedom a lot of the time. PD: What happens live? Do you then stick to the script? RR: We pretty much keep it as close as we can. I’m free to do whatever I want but I don’t like to try playing too much. I like to remain solid. I don’t want to get in anybody’s way. RR: (Thumbing through the BA 103 again) How long have you guys had this magazine? PD: Coming back to Smartso. Your studio is digital but Neil is famously in favour of analogue. called Redwood Digital for a while. He’s always exploring. great for editing and you don’t have to have all these huge machines taking up all the room. Who knows, down the road maybe I will go back to that. PD: Who have you had through Smartso? RR: Well, we did some Johnny Rivers stuff there. We’ve had Albert Lee. Joe Walsh has recorded there. It’s pretty much a word of mouth sort of thing. If I know somebody or they know somebody. It’s pretty much private and in the back part of my house so I try not to have too much stuff going on. But I do like to have it and of course I record things when I’m back there. PD: Do you get to do the engineering yourself? RR: I can but I prefer not to. I have done before but I prefer not to have to. PD: And I guess you also get to play on the recordings? RR: Yeah, a lot of them I get a chance to but not all. 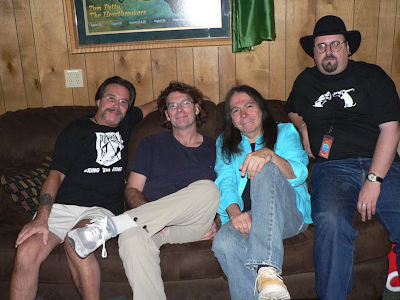 We had a project called The Wondermints (Brian Wilson’s backing band) in about a couple of years ago. They were doing their own thing. A good band. PD: Do you have an iPod and, if so, what’s on it? PD: You mentioned Chad Cromwell earlier, do you mostly work with Chad now? PD: Where do you see yourself going in the next few years? RR: I have no idea. There’s talk about touring with Neil next year out of the country, so I’m open for that. With Neil you never know. He might want to do some more recording so we’re kind of on hold. So I’m ready for anything. Hopefully we’ll go out. Hopefully we’ll go to Europe. I’m hoping for that. PD: There seems to be some confusion about the band introductions on the CSNY tour. You always seem to be from the town your playing in that night! RR: You know who did that? Graham Nash. He wanted to make sure I got a good round of applause, y’know. PD: So where do you hail from really? RR: Right here in California - Los Angeles, California. PD: Is there anything outside of music that you’re interested in? RR: Drugs, food and wine. PD: I’m going to need to edit this. I won’t put that first one down! RR: I don’t care, f*#k it. Soft drugs, marijuana. And tequila, real good Tequila. Other than that I try to take good care of myself. I try to hike three or four miles a day. At my age you got to take care. I really want to thank Rick for taking the time and effort to meet up with me and answer these questions. As he said himself, he’s a fan of the same music we are and he feels that he’s been very lucky to be able to get involved in that in the way he has. Obviously that’s not just luck. Rick is far too modest. You don’t get to consistently work with the stellar list of musicians that he has without being an excellent musician. Also, from my short meeting with him I think that he’s a gentleman in the true sense of the word. I also got to meet some other people backstage at Bridge including Gillian Welch, who I gave a copy of Broken Arrow to, and Bert Jansch, with whom I had a chat about us both being so far away from North London. Bert told me he was playing the Great American Music Hall the next week and invited me along but I couldn’t make that. Apparently Neil did, but he didn’t join Bert on stage as far as I can ascertain. I also got a brief chance to say hello to Pegi and Neil after the end of the show on Sunday. It had been a great day and Neil was clearly in high spirits. Pegi thanked us (the NYAS) for the donation made last year and it’s good to know she’s aware of our efforts on their behalf. Rick has an excellent website which can be found at http://www.rickrosas.com/. onto the stage - not to mention a surprising appearance by Neil Young in May 2005. Thanks Paul, Scott & Neil Young Appreciation Society's magazine Broken Arrow! A wonderful memory of Rick “The Bass Player” Rosas. Thanks TW for posting it here. Thanks Doc & Scott for making in all come "alive" again!